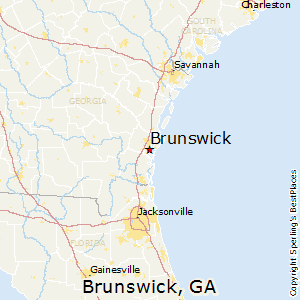 Brunswick, a historic port town located half way between Savannah and Jacksonville, Florida, serves as a gateway to the “Golden Isles” – the resort islands of Jekyll and St. Simons. Brunswick itself is quaint and full of historic interest, but also functions as a major port of entry for automobiles and other commodities, and has a substantial fishing and shrimp industry and some remnants of a once-larger chemical industry. But the big “growth” industry is leisure and retirement. The islands, which have been recognized leisure destinations for over 100 years, offer a wide assortment of leisure and resort activities and living accommodations. The Cost of living Index and median home prices are moderate but the latter have grown rapidly, no doubt affected by the influx of retirees and expensive estates on Jekyll Island and elsewhere. Coastal areas offer excellent recreation, including boating, golf and other resort activities. Bigger city services are 50 miles away in Savannah to the north and Jacksonville, Florida, to the south. Brunswick is located on a narrow coastal peninsula just east of I-95 along the Intercoastal Waterway. Jekyll and St Simons Islands, both easily accessible by bridges, lie just east. The terrain is generally level and typical of coastal areas. While the Atlantic moderates the subtropical climate year round, summers can be very hot and humid when sea breezes fail. Winters are generally pleasant with perhaps one or two colder periods each year. The area is vulnerable to tropical storms and hurricanes, but most Atlantic storms moving this far north tend to turn farther north into the Carolinas and further up the East Coast. The median home price in Brunswick is $132,700. Browse Homes in this Range.